When talking with my neighbors, meeting with parents at my kids’ school, sharing a good laugh with my mom-friends and listening to my clients … at some point, the conversation lands on the desire to better manage our time as parents and loosen a little bit the pressure we feel on our shoulders. Time management for parents. There’s a lot about that all around the web and if you ever googled ‘time management for parents” you may have lost your way in 42 “easy tips” to help you save some time. 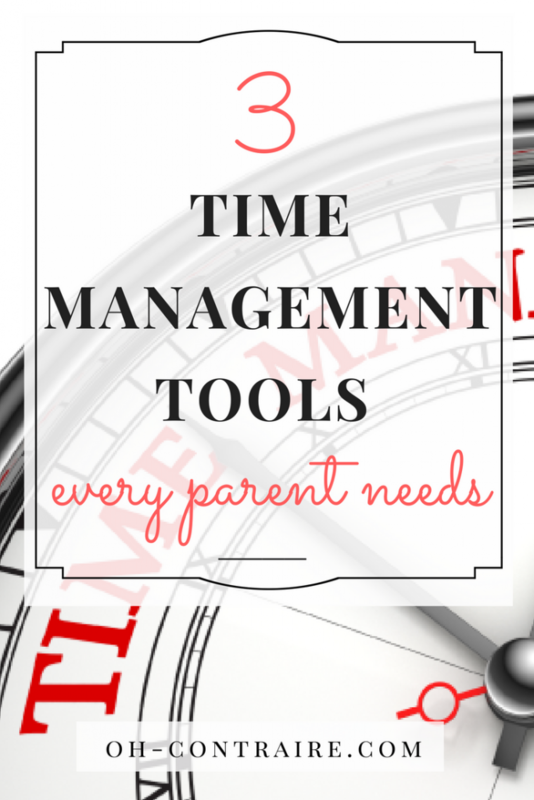 Better than an overwhelming list of tips, I’d love to share the 3 top time-management tools every parent needs. There’s really no way around this first tool. 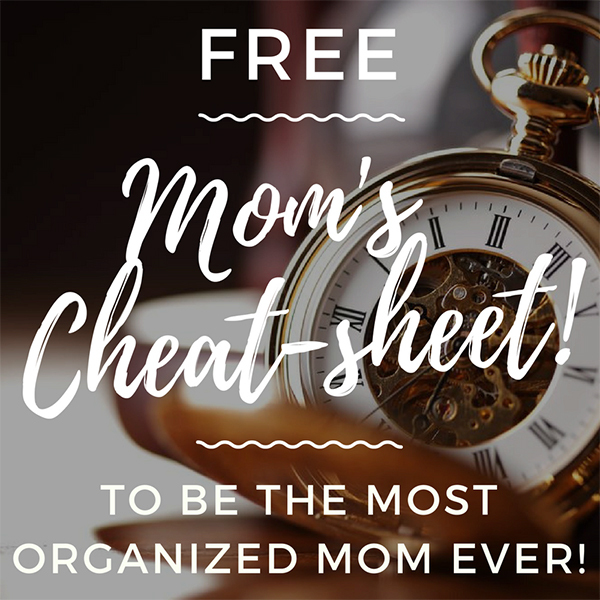 Maybe you’ve already been using a paper or digital planner for years so let me clarify: you would be surprised at how many busy moms I know who tried to manage their personal and family life without a planner. Sure, they have a calendar at work, full of work appointments, meetings, and professional due dates. But for family and personal appointments: Nothing. I really think every parent should give a planner a try. Indeed, the solution of gathering the post-it notes and papers from the school on your fridge won’t give you any of the benefits you’ll have in using a paper or digital planner. • It’s ONE unique place to gather all your appointments, important dates, work due-dates… but also birthdays, early pick-ups, playdates, school events, family events and extracurricular activities — everything related to the kids and your family life. No more forgetting, no more guessing, everything in ONE single place. • Having your whole month/week on paper will help you see immediately when you’re trying to fit too much. It’s your first vital first step to avoid an overburdened schedule and start saying no to new engagements! • While using a planner you’re also recording where your time goes: at the end of the week/month it’s a wonderful insight to better understand where your really time went and why you felt so much stress or pressure. This provides fundamental insights on what needs to be changed for you to feel less pressured. You’ll know what will work best for you. Personally, I’m a paper girl and I LOVE printables. So I use a Discbound Customizable Notebook overstuffed with free planning printables from all around the internet (here and here). But my to-go product for a more basic paper planner would be a simple weekly planner from your local office supplier, such as this one. On the digital side of planners, I’m no expert but I heard good reviews on the online the newly redesigned calendar by Google. • First, a routine helps you go on autopilot for all the mundane things that have to get done each single day of our lives as a parent: prep kids to school, self-care, prep meals or one load of laundry. Creating a routine will help you organize these to-dos in the most time-efficient way once and for all. No more running all around the house 5 minutes before heading to work! Convinced? If you’re looking for an easy and quick way to create your new routine, check my step-by-step plan over here. Too many to-dos, too little time! I don’t know any parent of young kids who is not suffering from this. Busy family + demanding work schedules + young kids = a good recipe for pressure.Therefore you need a plan!  Once your planner is gathering all the time-related events and due dates (Tool #1: your planner) and once you’re on autopilot for the mundane to-dos of your days (Tool #2: your routine), then having a Master To-Do-List will definitely make a difference. There are zillion ways to create the categories for your Master To-Do-List, but the simplest of all is, to begin with just 3: Errands to run, Calls to make, To-do at home… then adding what works for you. Some people find it useful to create one category of each of their roles: Mom / Wife / Work / PTA… or just area of their life, such as Me / Family / Work. This comes from David Allen and his method called GTD — Getting Things Done. Not new, but powerful! The goal is to help you better organize your time and get things done: not to create an incomplete inventory of still-unclear things. Actionable next actions are the next visible physical activity required to move something forward. Let’s take an example: You want to plan the family vacation and summer camp. Your next physical actions could be “Discuss tennis camp with husband”, “Research pricing for ….” or “Check tennis equipment in the garage”. Using your own combination of these 3 tools will drastically improve your time management and decrease the pressure on your shoulders. Because managing our time better is not about implementing a list of 42 ways to save time, it’s about being more intentional with the time we already have. And organizing your time with a Planner, Personal Routines and a Master To-Do List is definitely the most efficient way to begin this journey. I hope that was helpful for you! Let me know your thoughts in the comments below!